I've had this for a few years and it still works great. It's fairly quiet, pretty fast with little fuss..just add your ingredients and turn it on. Clean up is super easy and it has a small footprint, so it doesn't take up a lit of cupboard space. There's nothing like homemade ice cream! This high-quality item has been factory reconditioned. Please click on the icon above for more information on quality factory-reconditioned merchandise. This is a good basic ice-cream maker. It has a relatively small footprint on the countertop, and it looks sleek and functional. It is very easy to use, and the instruction manual contains a number of frozen dessert recipes to try. It is noisy, though, so make the ice cream *before* your guests arrive. The bowl requires pre-freezing, which takes up quite a bit of freezer space. Also, you cannot make multiple batches one after the other, as the bowl takes 5-6 hours to freeze back down to usable temperature after you make a batch. The paddle is plastic, and I wonder about how durable it will be in the long run. There is an opening in the top of the cover (for adding chocolate chips, nuts or fruit to your ice cream), which to me invites unwanted stuff falling in. I'd prefer if the additive chute had a lid. However, overall this item has already proved well worth the price. The drawbacks mentioned are also present on most other brands of ice-cream maker, unless you want to spend six times as much on a model with an internal compressor. I'd buy this machine again! Love this ice cream maker! This is an awesome ice cream maker! I bought it because I wanted to make my own ice cream using raw milk and no refined sugar. It's incredibly easy to use, cleans up in a snap, and makes perfect ice cream. I don't even bother with a recipe. I just mix up what I feel like using in a blender and pour it in. Come back 25 minutes later and voila! Perfect, soft serve quality ice cream. You can then put it in the freezer for a few hours if you prefer hard ice cream. Got a great deal on a factory reconditioned one, and the only thing wrong with it is a barely noticeable dent in the ice cream bowl. What a bargain! I would recommend it to anyone. I like the idea that it is electric and makes the ise cream outside the freezer. The only thing is that you do have to have room in your freezer to freeze the tumbler. It is easier to keep it in the freezer all the time, that way you can have ice cream whenever you want and they are right it only takes about 20 minutes. I have been using the pre-packaged mixes and making a quart at a time. Even works real well when I use non-fat milk with the mix. By making one quart, the ice cream is lighter and fluffier and my husband likes it really well, even before going to bed. The order came sooner than expected and the only wait I had was I had to put the tumber is the freezer and wait 24 hours for it too freeze. You can only use this ice cream maker for a second batch if you refreeze the tumbler for a good 6-8 hours. Otherwise the ice cream is not thick enough to add things like nuts and chocolate chips. 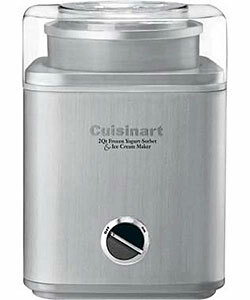 The Cuisinart Stainless Steel Ice Cream Maker was exactly what I wanted. Ordering and shipping were done easily and the package arrived faster than expected! As a gift to a dessert fanatic, the unit works perfectly, simply and quickly. Very easy to set up and clean up! Once we made our first batch, the kids couldn't wait to taste real home-made ice cream. Now the sky's the limit and we'll be enjoying lots of tasty frozen treats all summer long! Nothing beats home-made ice cream! I purchased this ice cream maker for my husband and he can't stop using it! It seems like every weekend he wants to make his own ice cream. As opposed to the store bought varieties, you know exactly what is going into it, and even the more time-consuming ice cream recipes are well worth the wait! What we have been able to make in this icecream maker far surpasses the quality you buy in the grocery store. We've even make 100% home-made ice cream cake! We always keep the tumbler in the freezer so it's ready to use anytime. It's fast, easy, and very quick clean-up. I bought this as a gift for my wife's birthday. She loves it. It's a classy, sophisticated-looking appliance, much nicer looking than most machines. Excellent capacity and value. It is noisy, but works very well. The machine I got had some wear. It was refurbished, but I expected it to look like new. However this was hardly noticeable, and for the price I'd rather have a gently-used, stainless steel Cuisinart than a brand-new, off-brand of lesser quality. Highly recommended if you can get one. I bought the Ice Cream Maker so I could have ice cream with no preservatives or artificial flavorings. It's a health issue. This ice cream maker is easy to use and makes a quart of delicious ice cream with only the ingredients I want to eat. Makes coconut ice cream very well. Easy to clean and it's attractive on my counter. 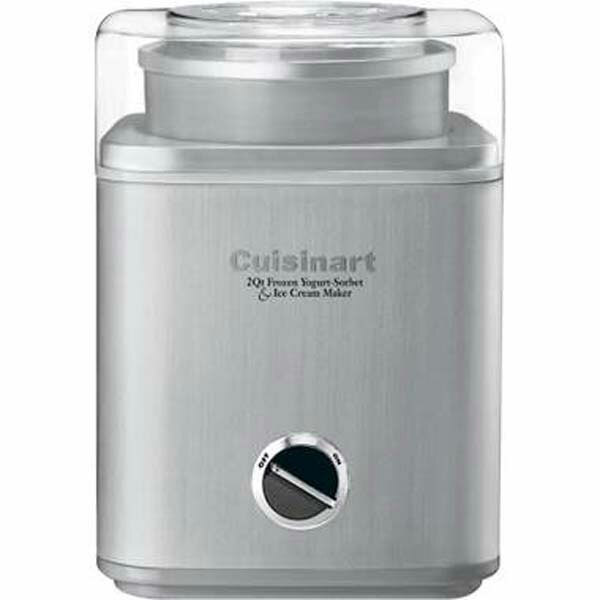 The Cuisinart Ice Cream maker works great and looks nice with the brushed stainless outside. The freezing canister is metal and NOT nonstick which is very hard to find. I don't like using nonstick cookware it will be banned soon anyway. I have always been happy with all the items I have purchased from Overstock.com and will consider more refurbished items for my kitchen. Oh ya it makes great ice cream and works at a quick pace around 10 min! I have only made Ice cream twice now, but it everything has went accordingly. It is very fast and easy. Just follow the instructions closely. Everyone that has tried the ice cream wants one of there own. I went for the 2 quart over the 1.5 quart model and am glad to have the extra ice cream.Cons: The machine is noisy to run for 25 min, but its not too big of a deal.The left overs seem to be very hard after frozen, seems harder than normal ice cream, not sure if there is something you can do about that, But it just needs to defrost awhile before you try to scoop.On top of one mixing arms the ice cream seems to get stuck therefore not mixing that portion.Overall it's a great machine! This is very easy to use. The recipes with the machine are simple and quick to put together, assuming you have the ingredients! The machine is noisy. During a dinner party it was hard to talk over the grating roar, eventually we moved the machine to a back bathroom and closed the door! There is a plastic cased version of this machine. The stainless is nice, but cost should enter into your decision. When you place the bowl in the freezer be sure to put some sort of cover over it to keep items from falling in, that is if your freezer is as cluttered as mine can get. I had a package of breaded pork steaks fall into the warm bowl and they froze tight. I had to use warm water to get them out and the result was the ice cream I made right after this event froze less than satisfactorily. Be sure all ingredients are cold before they are placed in the bowl for best results. Despite these comments, I am satisfied with the machine but not to the point of never buying commericial ice cream again. Hope that helps. I have tried the product and liked it, but it arrived with the little circle around the on-off switch broken off. I contemplated sending it back; I hate having something brand new that is already flawed. I ordered two of these, one for a friend's wedding. One had the paddle for churning the cream, the other did not. The seller did not replace the paddle, had to buy it elsewhere. It was only $5, but that was inconvenient. Great performance of the unit ..... fun appliance! I like this ice cream machine maker. I would have kept it, but someone bought us a KitchenAid Stand Mixer for our wedding, and so we gave this to a friend. It worked just fine, but my only complaint is that it's bulky. I bought this ice cream maker for my mom for christmas and she loved it. She reports that it's easy to use and has been able to try out many different kinds of ice cream with great results. Product works just as described. I am very pleased. Works fast -- had ice cream in less than 30 minutes. Love it. Very easy to use. I have only made the basic vanilla and added choc/peanut butter chips to recipe. Quick , not as noisy as some think! It only takes 25 min. to make. I set it to go and leave the kitchen.